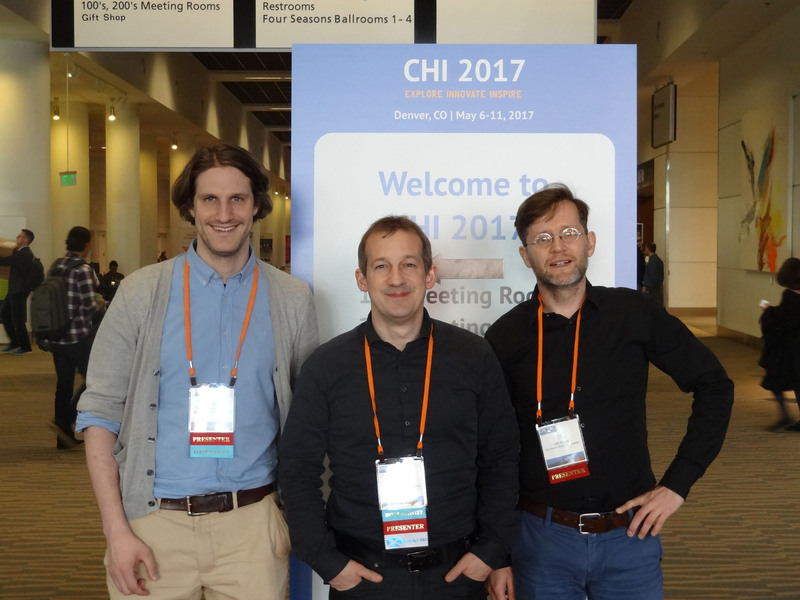 The ACM Conference on Human Factors in Computing Systems (in short CHI) took place in Denver, CO, USA from May 6 to 11. Three of us represented the Interactive Media Lab Dresden by presenting four contributions in total. Highlights were certainly the presentation of our two full papers by Ulrich von Zadow (GIAnT) and Konstantin Klamka (IllumiPaper) as well as our IllumiPaper research demonstration. From March 5 to 11, the International Spring School on Human Technology Cooperation “smart@work” was held at the Technischen Universität Dresden with 22 participating PhD students and Post-Docs from 15 different countries. During three keynotes, four talks and five workshops, questions about the future of human work were discussed, i.e., how to facilitate cooperation between people and technology as partners on equal footing. 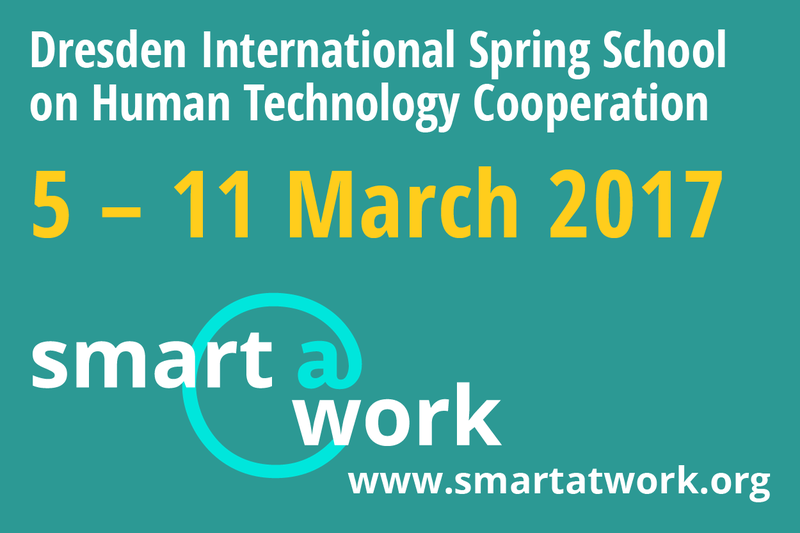 With 22 PhD students and post-docs from 15 different countries, the International Spring School “smart@work – Human Technology Cooperation” will take place at the Technische Universität Dresden from March 5 to 11, 2017. Within the field of human technology cooperation, smart@work will focus on how human beings can interact with machines and computers in future work scenarios. The goal is to facilitate cooperation between people and technology as partners on equal footing, and to benefit from their respective strengths. This requires the expertise of different research branches, which is reflected by the interdisciplinary organization team—of which we as Interactive Media Lab are a part. 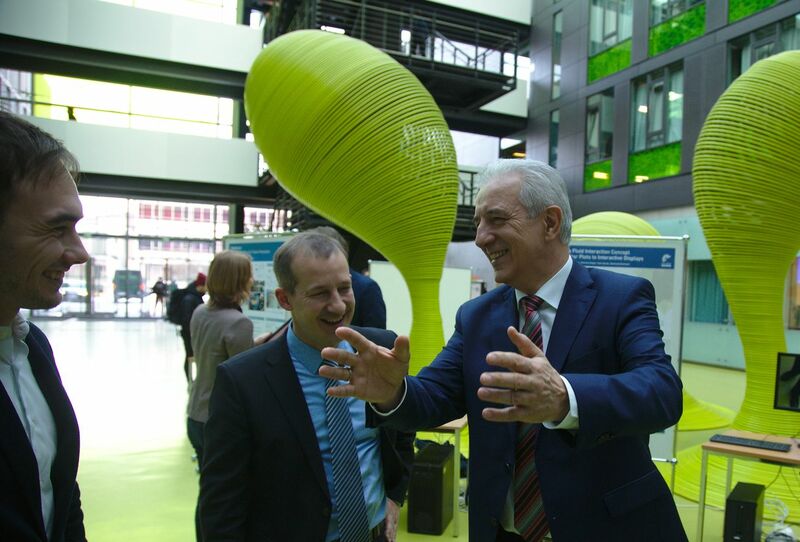 During a joined press conference, Saxony’s Prime Minister Stanislaw Tillich and Vice Prime Minster Martin Dulig announced the federal state’s support for the Digital Hub initiative. The goal is to establish a “Smart Systems Hub – Enabling IoT” in Dresden as one of twelve Digital Hubs in Germany. The ACM International Conference on Interactive Surfaces and Spaces took place in Niagara Falls, ON, Canada from November 6 to 9. This was the first time the conference was held under its new name instead of Interactive Tabletops and Surfaces (ITS). Five of us represented the Interactive Media Lab Dresden by presenting nine publications in total (see news). Highlights certainly were the presentation of our two papers by Patrick Reipschläger (MultiLens) and Ulrich von Zadow (Miners). This year’s last talk in our series Dresden Talks on Interaction and Visualization will be held by Professor Paul Rosenthal on 09/12/2016 at 13:00 in room APB E023. Professor Rosenthal is currently a visiting professor at the Institute for Computer Science at Rostock University. Previously, he was an assisting professor for Visual Computing at TU Chemnitz. The topic of the talk will be “Cognitive Processing and Human-centered Data Interfaces”. We cordially invite all those interested to this exciting talk. 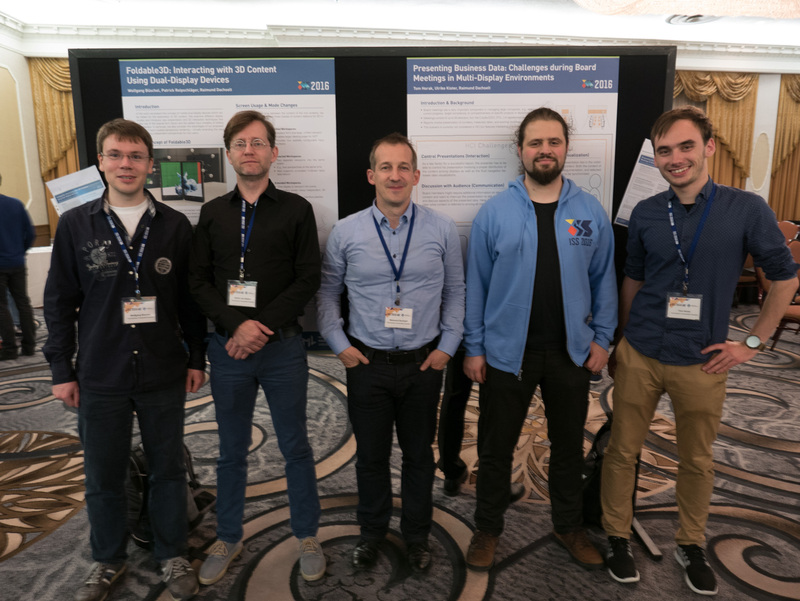 At this year’s ACM ISS (formerly known as ACM ITS) our group presents nine accepted contributions – 1 full papers, 1 note, 3 posters, 1 co-organized workshop, 3 workshop contributions. 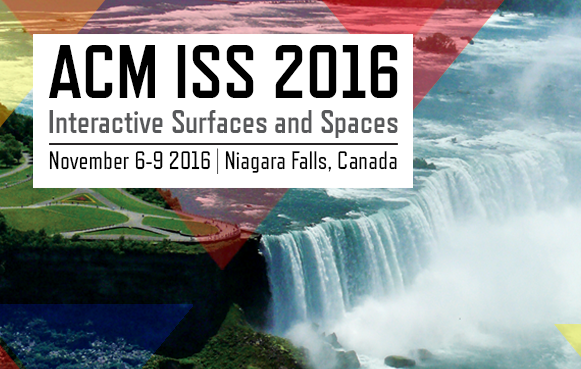 The 2016 ACM International Conference on Interactive Surfaces and Spaces takes place in Niagara Falls, Canada from November 6th to 9th, 2016. The subject of our full paper MultiLens: Fluent Interaction with Multi-Functional Multi-Touch Lenses for Information Visualization are the seamless and intuitive parameterisation, combination and visualization of magic lenses for touch-enabled interactive displays. Additionally, Ulrich von Zadow will present the note Miners: Communication and Awareness in Collaborative Gaming at an Interactive Display Wall which is joint work with students of our lab. The IEEE VIS, the biggest conference on visualization research, was held in Baltimore, Maryland (USA) this year from October 23rd to 28th. Tom Horak represented the Interactive Media Lab Dresden at this event with multiple contributions. On Sunday, he discussed our work Logging in Visualizations: Challenges of Interaction Techniques Beyond Mouse and Keyboard at the workshop “Logging Interactive Visualizations & Visualizing Interaction Logs” (LIVVIL). 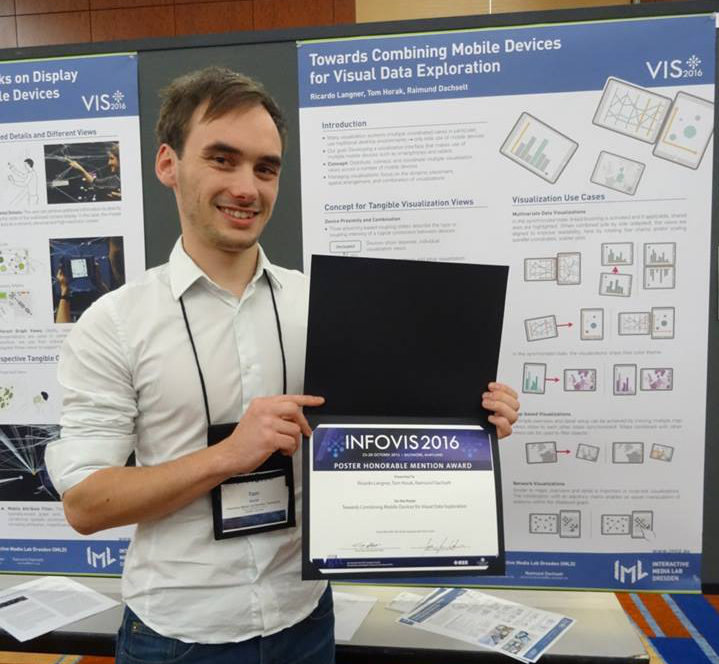 Furthermore, he presented two posters on novel interaction techniques for data exploration: Towards Combining Mobile Devices for Visual Data Exploration was awarded an honorable mention award. It describes the adaptations of visualizations as a result of mobile device combination. The second poster Supporting Graph Exploration Tasks on Display Walls using Spatially-aware Mobile Devices addresses graph exploration on large display walls by means of a mobile device. The next talk in our successful series Dresden Talks on Interaction & Visualization is scheduled for 21 November. Professor Albrecht Schmidt, head of the Human-Computer Interaction Lab at the University of Stuttgart, will be presenting is work under the title of “Amplifying the Mind with Digital Tools”. Professor Schmidt is one of the leading scientists in the field of HCI in Germany and we are very happy to welcome him to Dresden. The talk will take place on 21/11/2016 at 13.00 in room APB E023. Anyone interested is cordially invited.